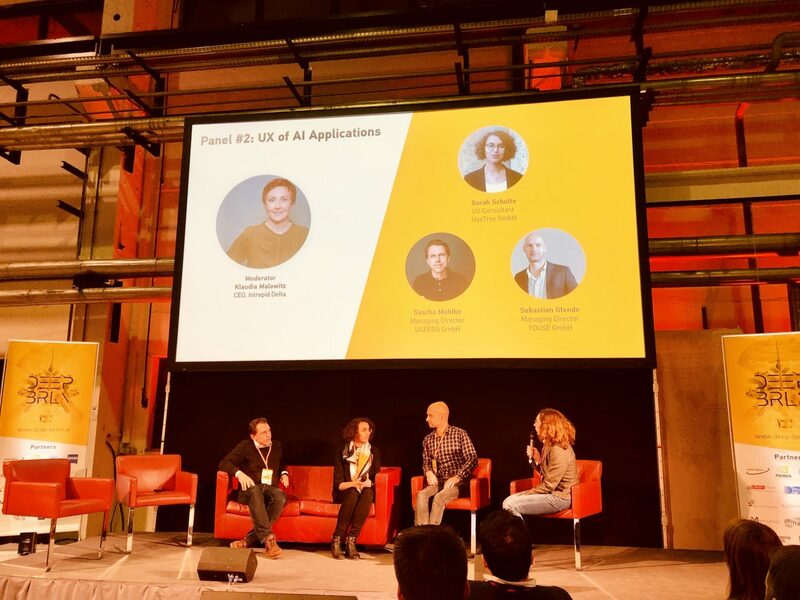 When AI experts met for the DeepBerlin conference, last Tuesday, they invited representatives of Berlin’s UX scene for a panel discussion. Our UX consultant, Sarah Schulte, talked about the current and future role of user experience in artificial intelligence applications, both today and in the future. Users’ trust – hard to win, easy to lose. Sarah Schulte, a trained psychologist, has a lot to say when it comes to the real needs of users interacting with artificial intelligence. The greatest inventions and applications are only successful if users love and recommend them. Which is why Sarah talked about how to gain and maintain the trust of users in the long run. Transparency is key: what data is stored? What is it used for? When are users interacting with a person, or actually a chatbot? This is where UX designers come into play, in their classic role as translators between humans and technical systems. To really tailor a product to its future users, UX designers and consultants are extremely important. They act as mediators between the perspective of the user and that of the software developer. In the future, the mediation between AI systems and users will become more necessary than ever.